I’ll bet you thought that “Sister Schubert” was the product of marketing folks sitting around a table brainstorming the image of a sweet and gracious Southern woman who just happens to make The Best Rolls Ever. Ever. But Sister Schubert is an actual real person — she really is a sweet and gracious Southern woman who makes The Best Rolls Ever. Patricia Barnes Schubert — “Sister” is her childhood nickname — is an Alabama native who built a successful bread company from her grandmother’s recipe for Everlasting Rolls. 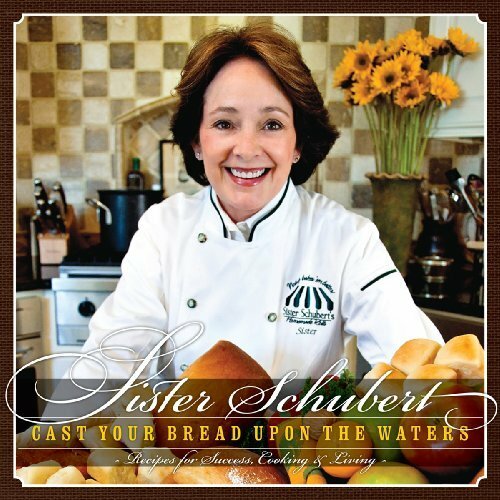 Schubert was in Tuscumbia, Alabama, this past week signing copies of her new cookbook, “Cast Your Bread Upon the Waters,” and demonstrating a recipe for Lemon-Blueberry Trifle at the weekly Spring Park Farmers’ Market. I sat under a tent with her for a few minutes and loved watching people come up to look at the cookbooks and then slowly recognize the woman sitting there as the woman pictured on the book cover. If I had a Sister Schubert roll for every time somebody said, “I didn’t know there was a real Sister Schubert,” I’d have a lot of rolls. These frozen delights are a staple for Southern meals — everybody’s got a pan or two stashed away for bread emergencies. Read the story I wrote about her visit to Tuscumbia and check out the recipe at http://www.timesdaily.com/article/20100616/NEWS/100619858. Her story of hard work and determination — and family and faith — truly is inspiring. This entry was posted in Alabama, books, food, shopping and tagged Alabama, books, bread, cooking, food, rolls, Sister Schubert, Southern cooking, Tuscumbia by Coffee with Cathy. Bookmark the permalink. Very cool! I often get asked if I am related to Betty Crocker (who is a marketing creation). Sister Schubert seems like a neat gal. Yep, this Southern household could not get along without those Sister Schubert rolls. I didn’t know she had a cookbook. I’ll have to check it out, especially after reading your interesting column about her. Amanda — Listen, my married name used to be “Myers,” so I know about guilt by association via last names! Connie — I knew you’d be a Sister Schubert fan!